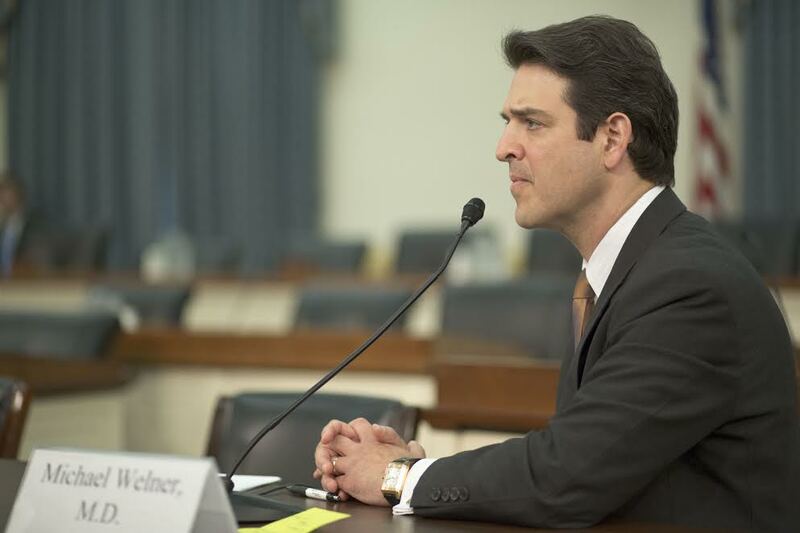 Part one of an exclusive interview with leading forensic psychiatrist Dr. Michael Welner on what makes a mass murderer - and what can be done to prevent those at risk of becoming killers from realizing their homicidal fantasies. In part one of this special two-part series, Welner discusses the similarities and differences in the motivations and execution of mass shooters and "traditional" terrorists. In part two (scheduled to be published Feb. 9), he addresses the best intervention techniques for handling each type of criminal, as well as the weak links in mental health laws and media coverage that could be mended to possibly prevent tragedies in the future. From a forensic psychiatry perspective, what are the biggest differences between "glory killers" like the perpetrators of the Columbine and Sandy Hook massacres and those who embark upon seemingly-politically motivated shooting sprees, such as the recent attacks in Orlando, Dallas and Charleston, S.C.? The commonalities are more notable than the differences. All of those killers listed above planned a spectacle crime and were notoriety-seeking. The perpetrators above were aspiring killers-in-waiting nurturing unrequited homicidal urges. Those who struck at the community around them without ideological linkage were contemptuous enough of others to be indifferent to killing indiscriminately. The ideologically-driven American mass killer, however, embraces a cause that lends (for him) righteous justification to his killing large numbers of people he has never met. The Orlando attack differed because Omar Mateen did act with material and logistic support. Even when it is difficult to demonstrably illustrate the network behind ISIS allegiance attacks, the social media infrastructure available to self-radicalize differs from other ideological instigators to mass shootings in America. The Orlando assailant was aided by his wife and possibly others. Micah Johnson may also have been aided by others, as the investigation has not yet been revealed to the public. But otherwise, the mass killer always has a story to tell of his grievances, whether they organize around an ideological theme or some other injustice that can be pinned as the fault of others. What are some of the common characteristics shared by your "standard" mass shooter and your domestic terrorist mass shooter? Psychiatrically, what does someone like Adam Lanza or Seung-Hui Cho have in common with someone like Omar Mateen and Micha Xavier Johnson in terms of motivations for mass violence? The community mass shooter and ideological mass shooter both recognize that spectacle murder will result in transcendent attention to them. Those who are primarily interested in their own hyperexposure will prepare with selfies, poses, films, social media postings and manifestos. Those mass killers who are driven by spiritual reward direct attention to the cause instead. The power of social media to facilitate Islamist radicalization resides in its ability to reach the alienated and devout who identify with the Islamic supremacist movement's utopian aspirations. Regardless of some of America's indifference to it, Islamic supremacism enjoys tremendous support in many countries and has the infrastructure to reach people who are already here – both to promote its entitlement as well as to impede its regulation. Mosques may have a facilitative role as well. Not enough information is yet available to ascertain whether black grievance mass killings are instigated by militant organizations. Whatever Micah Johnson's affiliations, the Dallas killings transpired amidst intense waves of hatred directed toward the law enforcement community, amplified by major news media in particular, that goaded violent retaliation for police shooting incidents. That external instigation alone differs from the ambition from which non-ideological mass killings arise. Their personal grievance draws no support from others, let alone the violence through which they bring it to our attention. Up until the 2015 San Bernardino attacks, many Americans saw "mass shootings" and "domestic terrorism" as separate menaces. Since then, we've had several major mass shooting incidents that could just as easily be described as politically motivated acts of terror - the incidents in Orlando and Dallas, most notably. Would you say it's safe to assume that the two social blights have merged over the last two years as a public safety issue, or do you believe that we should continue to separate politically-motivated mass shootings from other mass shootings and examine them and pursue interventions for them as totally different social phenomena? The proliferation of mass homicide attacks ties to the hyperexposure the mass media provided to perpetrators in the early 1990s as 24 hour news became a competitive industry. The Islamic supremacist movement has more recently co-opted this modus operandi of asymmetric warfare. Those Islamists who cultivate mass killers know that the press will give priceless exposure and will humanize the perpetrator as someone that viewers and readers can identify with. Given its aspirations, the Islamic supremacist movement is wise to employ this strategy as an effective marketing campaign. Using the deep web or taking advantage of law enforcement's false narratives about "lone wolves" enables the Islamic supremacist movement to demonstrate how easy it is for followers to achieve martyrdom and heavenly blessings. From a crime prevention standpoint, it is a tragic mistake to separate mass shootings based on ideological explanation. All mass shootings of strangers are spectacle incidents designed to gain transcendent notoriety. Therefore, eliminating the social incentive – be it the poignant humanizing of a perpetrator's failed life or the serious consideration of one's adopted cause – delegitimizes the incentive. 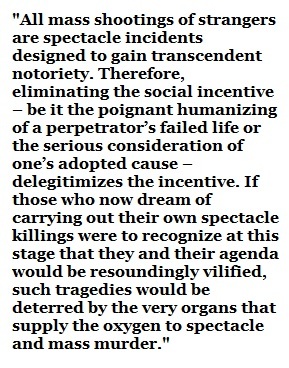 If those who now dream of carrying out their own spectacle killings were to recognize at this stage that they and their agenda would be resoundingly vilified, such tragedies would be deterred by the very organs that supply the oxygen to spectacle and mass murder. Demographically, how do politically-motivated mass shootings differ from non-politically-motivated mass shootings? Is there any particular group most at-risk for perpetrating politically-motivated mass shootings, and if so, what are the social dynamics that make them most different from other mass shooters? Islamic supremacist American mass killers are demographically different from other ideologically-motivated mass killings. Theirs is a journey in which they follow widely accepted teaching that they achieve spiritual heights by carrying out spectacle martyrdom killing. No other ideologically-motivated spectacle crime responds to a widely accepted promise of redemption. Thus Islamic supremacist mass killing is by far the most rational of acts and attracts a more socially integrated demographic – including, uniquely, women. Motivations among mass homicide perpetrators of other ideologies reflect agendas grafted onto simmering homicidality that recognizes killing innocents to be altogether wrong. The underlying personality – of an underachieving man for whom destructive violence represents idealized masculinity – is not different from those who kill indiscriminately without ideological grievance, as they merely attempt to achieve a body count and the notoriety that comes with such a tally. The claim of killing for a cause provides a pretext to those inspired to kill even people unrelated to their grievance or actually supportive of it. Dylann Roof is a good example of a floundering and socially and vocationally inadequate dead-ender who donned the cloak of white supremacy preceding his mass killing, yet was demonstrably passionate about the ideology for only a number of months. We are shocked by what these killers do. But in actuality, it is their furious self-absorption which has the most depth of all. Generally, Americans view domestic terror as something of a three-pronged problem: the Islamofascist threat, the extreme right/white nationalist threat and the extreme left/black nationalist threat. Do you think this paints a truly complete portrait of politically motivated mass shooting threats in the U.S., or do you believe that each contingent is best examined as a separate phenomenon? For example, should different preventative measures be taken to combat Dylan Roof-esque white nationalist attacks than Micah Xavier Johnson-esque black nationalist attacks, or should law enforcement officials follow the same general guidelines in deterring and interdicting all politically-motivated mass homicides, regardless of the underlying ideology? It is counterproductive to relate to domestic terrorism as a three-pronged problem. Terrorism, by definition, is an action designed to inspire fear among large populations unaffected directly by the attack. Any ideology is capable of promoting such intent. Islamic supremacist terrorism is far more prevalent because it leverages social media infrastructure, religious utopian reward and widespread entitlement in ways that other terrorism does not and cannot. Deterring Islamist terrorism is therefore a bit more involved than other ideologically motivated spectacle killing, because it requires a religious intervention and not merely public safety measures. 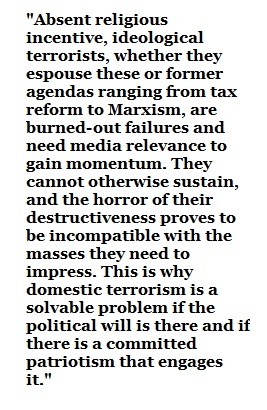 Other ideologically-motivated terrorism is fringe and cannot sustain itself. White supremacism, for example, is so appropriately denounced that the marginal characters who act with terrorist motivations only hurt their cause and push their efforts further from the mainstream that they seek. Black grievance terrorism, be it the gutting of Ferguson and parts of Baltimore or highly publicized violence like Mr. Johnson's mass killing, has benefited enormously from news media openly goading race war. Absent the news media to legitimize and foment overheated rioting and looting, black America would be as embarrassed of racial arsonists who cannibalize harmony as is white America is of outdated racial separatists peddling baseless hatreds. Absent religious incentive, ideological terrorists, whether they espouse these or former agendas ranging from tax reform to Marxism, are burned-out failures and need media relevance to gain momentum. They cannot otherwise sustain, and the horror of their destructiveness proves to be incompatible with the masses they need to impress. This is why domestic terrorism is a solvable problem if the political will is there and if there is a committed patriotism that engages it. When you look at politically-motivated mass shooters, what are the commonalities they seem to share, regardless of their ideological motivations? Furthermore, how does this change along religious and racial lines? What's the biggest difference, forensically, between a white nationalist mass shooter and a black nationalist mass shooter, and perhaps between a hardline Muslim mass shooter and a hardline Christian mass shooter like Robert Dear? The biggest distinction among ideologically motivated mass killers is in how widespread their views are shared. The more mainstream the support for their actions, the more likely those actions will be repeated. The issue, for example, is not the difference between Christianity and Islam. The difference is that a large percentage of Muslims wholeheartedly support Islamic supremacism to be gained by any means. That is just not the case among Christians, even those who privately would welcome theocracy. This isn't the 11th century anymore, in which the Crusades took place, but to many, this is the 7th century, mimicking the spread of theocratic Islam. As for racial motivations, we are all Americans who want the same opportunities. Proper and mature leadership would limit the prevalence of tribal strife just as cynical Machiavellianism ignites it in other countries.